With legs long enough to straddle a Buick, this sea monster plucked from the depths of the Pacific Ocean, measures a staggering ten feet from claw to claw. It currently resides in Britain at the National Sea Life Centre in Birmingham, and retains the honor of being the biggest crab ever seen. Of the genus arthopod (Macrocheira kaempferi in Latin) this creature is still growing and could live up to 100 years, its legs eventually reaching fifteen feet! It is not known how old the crab is, and its body is the size of a basketball. Dubbed “Crabzilla” for obvious reasons; had Jules Verne seen this creature perhaps he might have chosen it over the killer squid in Twenty Thousand Leagues under The Sea. 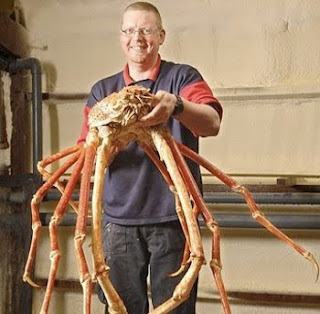 This giant crab is a lethal and fearful predator in ocean depths of up to 2,500 feet, but out of the water looks weak and limp because its limbs are so heavy that the body can’t support it. In the ebb and flow of the balance of nature, this big fellow has its enemies as well, but they all have two feet and open mouths. Salted and steamed, the Japanese Spider Crab is considered a delicacy in Japan, although they are banned in the spring when they lay their eggs. “It is rumored these crabs can grow to four meters (about 14 feet) across. Our open-topped ray tank has the icy cold waters Crabzilla needs, and will be his home until the end of March. He absolutely dwarfs the other crabs in there, but he’s not aggressive and they should have nothing to worry about,” says Graham Burrows, curator of the National Sea Life Centre. The front limbs of the Japanese Spider Crab are feeding arms, with each one measuring over five feet long and ending in sizeable claws.